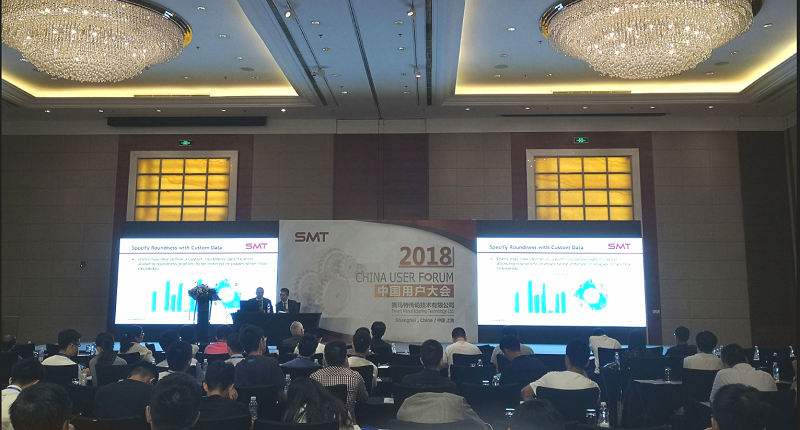 SMT is proud to announce the success of the 2018 China User Forum on the 21st September that took place at the Shanghai Marriott Hotel. Hosted by SMT, the User Forum saw attendees reach almost 160, amongst which were senior executives, engineers, professors as well as John Edwards from the Shanghai British Consulate. The forum provided a great opportunity for customers and partners to learn about new and emerging developments of the company and industry trends, including the upcoming release of MASTA 9, the next major software release of SMT’s signature CAE software. During the Forum, SMT reviewed functionality improvements in the past year and introduced technical services advantages and capabilities including future development plans. Topics also included bearing analysis capabilities and electric vehicle whine noise from SMT experts and guest speakers. Dr Owen Harris, Director of Research at SMT, opened the Forum with a discussion of how SMT has helped the development of the transmission industry in China starting from when the first office opened in 2002 through to the development and reach of SMT as a business today. It is notable that this instrumental company growth has seen the recent opening of the Shanghai office earlier this year, to meet and facilitate the growing business needs of East China as a significant step in the development of SMT as a business. The significant steps of SMT’s continued success and development to stay at the forefront of innovation and transmission industry developments continue to exceed customer needs and the Forum is a great opportunity to centralise customers at the annual conference.